All of these materials are locally available. At this point in time there is not enough data to calculate the annual expenditures and the costs per unit of material dried. The principal operational problem is that the mastic used does not completely seal the joints and allows the penetration of rainwater in the space between the glass sheets. The limiting factor for the extension of use of the dryers is mainly the absence of a tradition in the use of such a technology. This dryer type is a widely available design of direct solar dryer. It is easy to build from almost any kind of available building materials and simple to operate, maintain and control. It is a small-scale dryer versatile in operation and it can be used to dry a wide variety of agricultural products. Tested and utilized in many countries and under many different climates, this dryer has proven to be a very effective and useful device for small-scale food preservation. The dryer is essentially a solar hot box, in wnich fruit, vegetables Or other matter can.be dehydrated on a small-scale, in essence it consists of a rectangular container, insulated at its base and preferably at the sides, and covered with a double-layered transparent roof. Solar radiation is transmitted through the roof and absorbed on the blackened interior surfaces. Owing to the insulation, the internal temperature is raised. Holes are drilled through the base to permit fresh ventilating air entry into the cabinet. Outlet ports are located on the upper parts of the cabinet side and rear panels. As the temperature increases, warm air passes out of these upper apertures by natural convection, creating a partial vacuum and drawing fresh air up through the base. As a result there is a constant perceptible flow of air over the drying matter, which is placed on perforated trays on the interior cabinet base. Dimensions: see Figure 2 and also the following case study. This type of dryer has now been in use successfully in many locations throughout the world and in varying climatic conditions. Originally, the solar cabinet dryer was .developed and tested in Douma, Syria and in Barbados, west indies. (1) the length of the cabinet should be at least three times the width so as to minimise the shading effect of the side panels. (2) the angle of the slope of the roof covering should be taken from Figure No. 3. This gives the optimum angle for drying seasons as a function of the latitude. The graph is equally applicable to areas north and south of the equator. 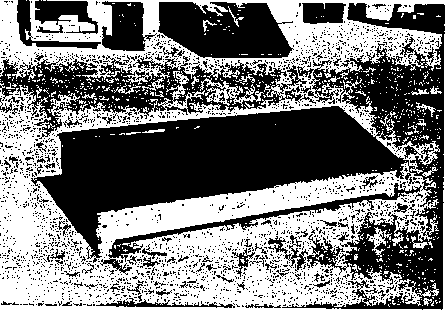 Note that for latitudes less than 20° North or South of the equator, the slope of the transparent roof is constant at 6®, This is to allow a minimum difference in elevation from one side of the collector to the other in order to permit adequate convective air circulation over the drying area. in general, the covers made with plastic film have a limited life. It is therefore necessary to use films which have been treated to give protection against ultra-violet radiation. The latter can be polyester, polyvinyl chloride or polyethylene. Generally films of the polyethylene or cellulose acetate types should not be used due to their limited life. They would have to replaced at the end of each drying season and might not give as favourable results in service. Although it may be advantageous to replace covers seasonally in certain cases, trouble may occur with films not being able to withstand the high cabinet temperatures generated. These may reach as high as 80 to 100 degrees centigrade in some dryers, we would advise people interested in this type of unit to use ordinary window glass, supported by a suitable frame to their installations. The use of a sealant to hold it to the frame is a possibility, but if a sealant is not used, the glass should be held firmly in place by a suitable frame, painted black. (a) portable Models: wood, metal, hardboard, plywood for the more sophisticated units* or basketwork, wicker or bantooo for the more primitive units. Perforated cabinet bases and side panels might possibly be fabricated by placing insulation between layers blackened wicker or open basketwork. This would cut down costs and make use of local industry. (b) Permanent Structures: adobe, brick, stone or concrete. (5) The insulation should consist of locally available materials such as wood shavings, sawdust, bagasse, coconut fibre, reject wool and animal hair. In areas affected by wood ants, termites or other noxious insects, the susceptible materials should be properly protected before being placed in the insulation base. 5 cm thick, both at the base and side sections. Holes should be drilled in the insulated base and fitted with short lengths of plastic and rubberized garden hose (or bamboo, etc., if available). Where insect infestation is prevalent, all cabinet apertures should be covered with fine mosquito netting, (preferably fibreglass) or gauze. Generally the high temperature of the cabinet interior discourages insects, rodents, etc., from entering and feeding on the drying produce. Furthermore, in arid areas where there is a high concentration of airborne dust and debris, the transparent cover eliminates product contamination. (7) The transparent cover can be attached to a frame which can then be fixed to the chassis of the cabinet. Care must be taken to ensure that the cover is completely watertight so as to avoid deterioration of the interior and wetting of the insulation. All components of the cover framework should be painted black or some other convenient dark colour to absorb the maximum solar radiation. Hold down strips should be secured to the upper exterior rim of the cover frame to protect the film against excessive wind suction lift. (8) Once the cover and chassis are secured, several holes should be drilled in the rear and side panels. These provide the exit ventilation ports to remove the warm, moist air. The number of holes is dependant on the climatic conditions and the nature of the drying material. 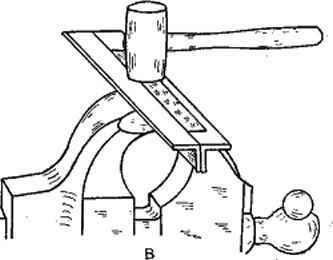 A satisfactory method is to initiate the dryer with a minimum of side ventilation ports and to drill further holes as needed so as to prevent internal moisture condensation. This method prevents an excess of ventilation ports being drilled. (9) The rear panel should be fitted with access doors to give entry into the cabinet. All doors should be placed on the rear side to prevent excessive shadowing of the dryer during handling operations. 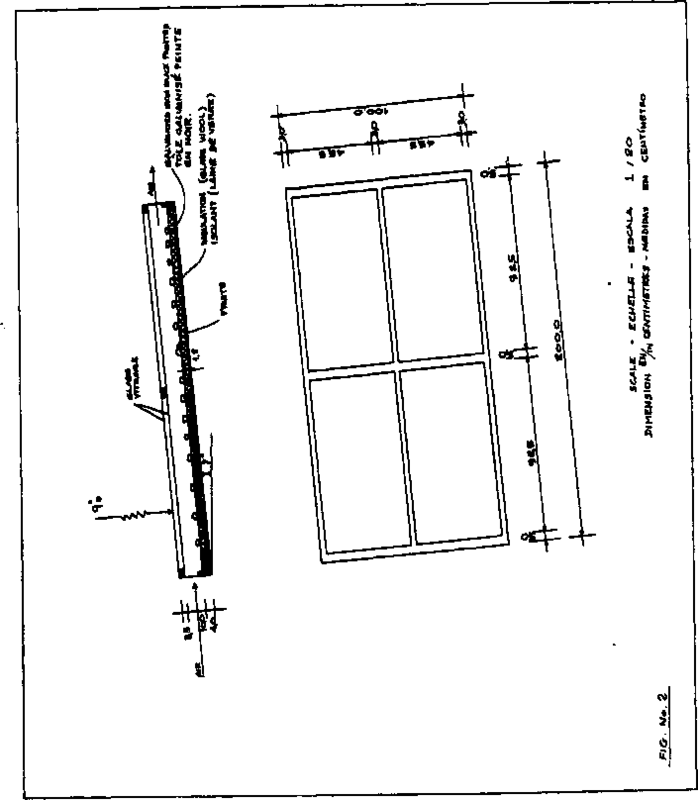 (10) Trays should be constructed as indicated, of galvanized chickenwire or some similar material. They should be placed on runners a few centimetres high so as to ensure a reasonable level of air circulation under and around the drying material. (11) The interior of the cabinet should be painted black. The exteriors of the side, rear and base panels should be pain to»* *»ith aluminum paint. If desired, the interiors of the side and rear panels can be covered with a layer of aluminum foil, if the latter is not available, paint these surfaces black. The dryer operation is not complicated. The produce to be dried should be pretreated in the usual manner (i.e. blanched and fumigated) and placed on the perforated trays, at a loading rate of about 7,5 kgs/meter2 of drying area. A small thermometer inserted into one of the ventilation ports will prove very handy. The thermometer bulb should be shielded from the direct rays of the sun. The upper temperature limits which can be withstood by agricultural produce vary substantially. Where the drying produce might suffer from the direct sun-rays or where the light colour of the produce reflects much of the incident radiation, it is advisable to cover the loaded trays in the dryer with a black plastic mesh or black gauze. This should not inhibit the flow of air through the trays, but will absorb the radiation and transmit the heat to the produce through conduction and convection. The resultant temperature increase can be controlled by opening the rear access doors. This approximate temperature control system can easily be mastered with time and experience. The following table on drying data gives some indication of the temperature limits and possible throughputs available with a dryer of the size and specifications shown in this case study. The table give yields for dry, arid, cloudless Mediterranean type climates. The yields should be suitably modified for the cloudy, more humid temperate and tropical regimes.